Cases involving social media are published on a daily basis, and if social media evidence doesn’t routinely factor into your litigation (if you are a lawyer) or electronic investigation practice (if you are a consultant or in law enforcement) then you are likely missing massive amounts of relevant evidence. With that in mind, when reviewing the recent case law involving social media evidence over the past several weeks, one case that particularly stands out is Stallings v. City of Johnston, 2014 WL 2061669 (S.D. Ill. May 19, 2014), which clearly illustrates that printing out Facebook pages for production in eDiscovery is a really bad (and expensive) idea. In this case, plaintiff Jayne Stallings brought suit for wrongful employment termination against the City of Johnston, her former employer. And it seems that Stallings, like millions of others, was an avid and highly opinionated Facebook poster. So to respond to discovery requests, Plaintiff’s counsel and a paralegal spent a full week printing out the contents of Plaintiff’s Facebook account — which amounted to over 500 printed pages — manually rearranging them, and then redacting them. Plaintiff counsel also claimed that she could not provide the relevant Facebook information on a disk, and thus had to resort to paper production. This exercise was obviously costly. A week of paralegal and lawyer time could easily run $25,000 and no client should pay anywhere near that amount for a task that, with best practices technology, would require minutes instead of days to perform. But the high cost is only the tip of the iceberg. The stakes regarding social media evidence are now even higher, as recent revisions to the American Bar Association rule on competence requires lawyers to both understand the basic features of technology and to be informed of the risks and benefits associated with the use (or non-use) of relevant technology. (Model Rules of Prof’l Conduct R. 1.1 cmt 6). Many legal commentators note that the duty of competence arguably requires lawyers to conduct online investigations of opposing parties, key witnesses, jurors, including looking at social media. To do that, lawyers must understand how to utilize social media in the most effective manner. For instance, there is a wealth of publically available social media evidence relating to opponents and key witnesses alone. Our clients are routinely collecting thousands, and often hundreds of thousands of social media items in a single case. The ability to cast a wider net and quickly sift through the data through powerful searches and metadata filters (and provide a very efficient means for electronic production that Stallings’ lawyer claimed was impossible) enables much more relevant evidence to be found and utilized to advance the case. 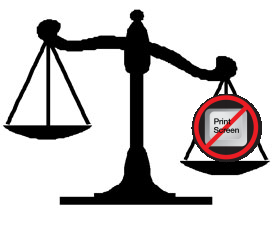 When lawyers and their representatives resort to print screen, they are dramatically limiting the scope of their collection and are failing to collect key metadata. What should take a few minutes with automated best practice tools would require several days, if not weeks, if the manual print screen command is used. In addition, simple screen captures are not defensible, with several courts disallowing or otherwise calling into question social media evidence presented in the form of a screen shot image. The good news is, unlike other areas of digital evidence, there is no trade-off with speed, cost and defensibility by utilizing best practices technology. Quite the opposite. 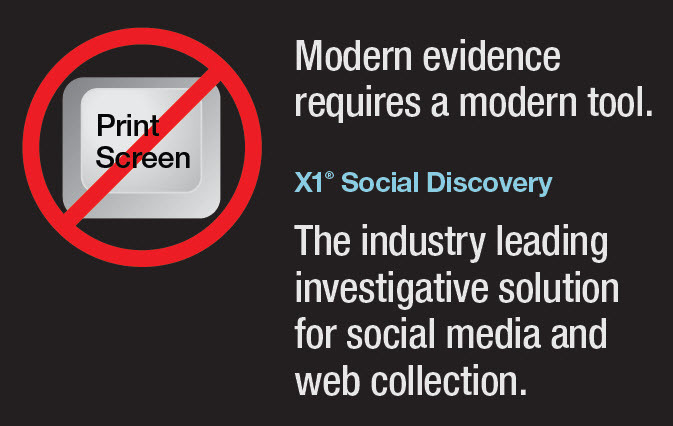 X1 Social Discovery, is much faster, much more defensible and — as the Stallings case illustrates— much less expensive than print screen. So you can either have your cake and eat it too with X1, or incur much higher costs, overlook mountains of potentially case-winning evidence, arguably violate your ethical duty of competence, and face evidentiary challenges in court with print screen. Your call.